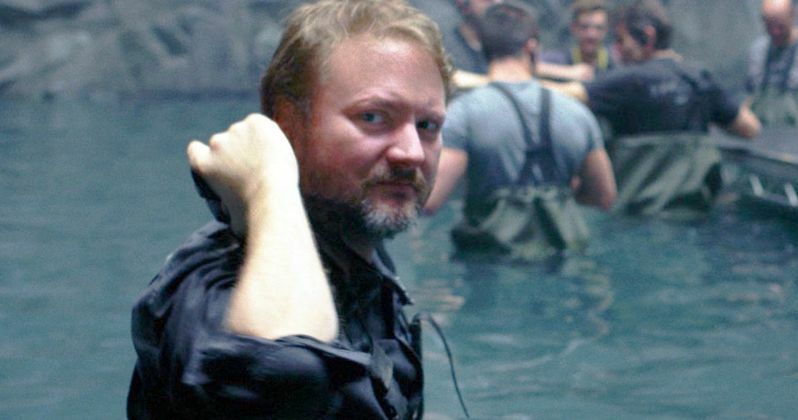 Has Rian Johnson bailed on his plans to write and direct an all-new Star Wars trilogy outside of the Skywalker saga? A rumor spread quick like wildfire across Twitter tonight that he'd bailed on his post at Lucasfilm. But before the news got too out of control with tweets and retweets from "insiders" who love to think they're "hearing rumblings," Rian Johnson jumped in to end all the speculation, targeting the source of the leak in his response. "No it isn't true, I'm still working on the trilogy. With all due respect to the movie bros, who I'm sure are lovely kind bros with good fraternal intentions." More than a year after its release, The Last Jedi remains the most divisive movie in the entire Star Wars franchise. Just as many love it as hate it, but the people complaining have been the loudest. And they have not kept quiet about their desire to see Johnson's planned trilogy, which would focus around never-before-seen characters, crash and burn. Those outspoken individuals thought they'd finally gotten their wish tonight. Though Rian Johnson's exit was being heavily rumored, it still has not come to pass. Word shot across social media faster than normal that Rian Johnson was leaving Lucasfilm. This vast universe in a galaxy far, far away is once again said to be in flux, as fans anxiously await a title reveal for Star Wars 9, with a trailer rumored to drop at this year's Star Wars Celebration in April. No one at Disney or Lucasfilm have confirmed any solid plans for what the future holds after Star Wars 9, only announcing secretive trilogies, and canceling any planned standalone movies. Those behind this rumor simply stated that Johnson had walked away from the franchise completely with noting else to back up their claim, or a reason for his departure. This wouldn't have been the first time that Lucasfilm kicked someone to the curb. Chris Miller and Phil Lord were famously fired from Solo, and Colin Trevorrow had Star Wars 9 ripped out from underneath him. if this latest rumor had turned out to be true, it's more likely that we would have actually heard word about it directly from Lucasfilm or Disney themselves. It was announced that Rian Johnson was directing an all-new Star Wars trilogy before the Last Jedi hit theaters in December 2017. But that movie tore fans down the middle, splitting an already fractured fanbase. The Last Jedi didn't bomb at theaters. It was a hugely successful sequel, turning $1 billion in profits while dominating the home video charts. Though, fan reaction was all over the charts, and many took to social media to air their grievances. Youtube channels devoted to tearing down the new Lucasfilm regime led by Kathleen Kennedy sprouted up, giving birth to The Fandom Menace, with some of its biggest supporters being Geeks & Gamers, alongside the lesser known Comic Arts Pro Secrets. Those that love the film went on about their business, and did not devote hours to heaping praise upon it. Which resulted in any admiration for the sequel getting drowned out by all the hateful noise. The biggest complaints lobbed at the film were the poor treatment of Luke Skywalker, something even Mark Hamill seemed to agree with. Snoke's death has been a major point of contention. And the constant trashing of Rose Tico caused actress Kelly Marie Tran to feel personally attacked, causing her to leave social media, deleting her accounts in the wave of backlash. Rian Johnson hasn't actually been devoting much time to the trilogy since he finally got The Last Jedi into theaters. He instead decided to write and direct a murder mystery thriller called Knives Out, which has wrapped and is in post-production, and will be in theaters towards the end of this year. The movie has Johnson returning to his noir roots, and it's been compared to his first movie Brick. He lined up an impress ensemble cast that includes James Bond himself, Daniel Craig, Captain America actor Chris Evans, Lakieth Stanfield, and Halloween scream queen Jamie Lee Curtis. The Star Wars franchise will definitely continue into the future. Star Wars 9 will be in theaters this December, bringing the Skywalker saga to a close. D.B. Weiss and David Benioff are making an all-new trilogy. And Jon Favreau is the ringleader on the first-ever live-action Star Wars TV show called The Mandelorian, which is being created for Disney+ streaming. It will be followed by a Rogue One prequel revolving around Cassian Andor. Now it sounds like Rian Johnson's trilogy will continue chugging along too. This rumor first sprouted up at Superbromovies. Rian Johnson later clarified the fake news on his Twitter.